It's been a while since I baked my last cookies, and here we go again with the next load! I guess man is a creature of habit. For more than two weeks now I've had my little cookies as a desert after my healthy lunch at work. I have to admit that I cannot resist sugar and I always need a little sweet element after a savoury dish. So this time I was thinking about the straight opposite of last time's crunchy chocolate chip cookies. Dried fruits, some walnuts and a lot of oat seemed to be the perfect solution. When I tried the first cookie I knew that these would be regular guests in my cookie jar. 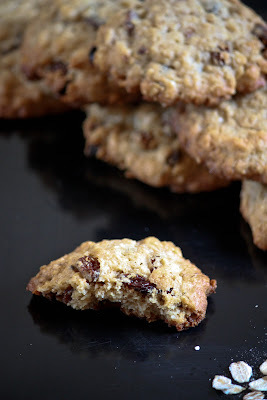 The combination of cinnamon oats and raisins couldn't be any better especially with that gooey texture. If you don't like raisins, you can just replace them with dried cranberries. In a large bowl, put together the butter, brown sugar, egg and the vanilla extract until you get a smooth mixture. In a separate bowl, whisk the flour, baking powder, cinnamon and salt. Then stir the dry ingredients into the sugar-butter mixture. Stir in the raisins, walnuts and oats. It depends on how you prefer your cookies but if you like them thick and chewy, chill the dough in the fridge for a bit before forming the cookies on your sheet. The baking time needed for your cookies depends on your oven and on how long you chilled the dough. In general you should bake them for 10 to 12 minutes. Take them out when golden at the edges but still a little undercooked-looking on top. For those not used to making cookies here a little advice : Let them sit on the hot baking sheet for 3-4 minutes before you transferring them to a plate. I bought a pair of Balenciaga shoes for my boyfriend at this online store.cheap balenciaga replica sneakers The quality is very good, the style of the sports shoes is very like, it is very worth buying, buy balenciaga replicathere are many famous designer brand replicas of the Balen family, we are sure that it has high quality and appearance.